Whenever Yu Fan's cards are discarded, he can place them on the top of the deck. At the end of his turn, Yu Fan can choose any character. This character flips the top card of the deck. If it is a piece of equipment, this card is placed in their equipment area and they recover one unit of health. Otherwise, the card is placed in their hand. "Release Into Abyss" can be activated any time Yu Fan discards cards, whether this occurs in his discard phase, being targeted by Break, or a character ability. He cannot activate this ability when he plays cards. "Release Into Abyss" takes priority over Cao Zhi's "Fallen Bloom" and Zhang Zhao & Zhang Hong's "Stubborn." Yu Fan can target himself with "Blunt Words." The target of "Blunt Words" cannot refuse to draw the card and equip it if it is an equipment card. If the target of "Blunt Words" draws a type of equipment that they already have equipped, the drawn equipment replaces the existing card in their equipment area. The analogous card is then discarded. The target cannot refuse to discard their existing weapon. Yu Fan may seem weak when looking at his abilities, but they are stronger than they appear, especially when they are used in conjunction with each other. 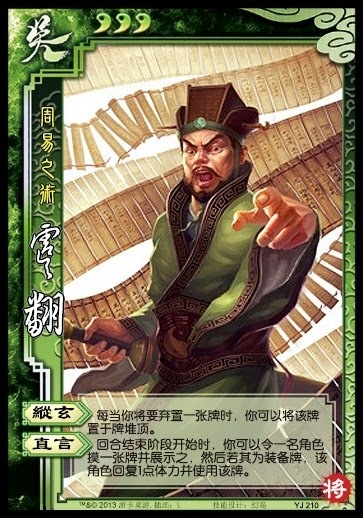 Yu Fan can discard an equipment card and place it on top of the deck via "Release Into Abyss," then select any character (including himself) and have them equip this card and regain a unit of health via "Blunt Words." This is quite powerful, as it allows him to fortify an ally (or himself) and heal them simultaneously. Even if he does not want to take this approach, "Blunt Words" is a useful stand-alone ability. The extra card is always nice.